A -lot- of time and effort have went into this post and your appreciation keeps me motivated to continue my work here. Don't worry, this post isn't dead. I will continue to update with more fixes, tweaks, and upgrades as they come available (I look forward to revamping this whole thing is the community edition of webOS hits! So you're a new member of the Touchpad family and don't know where to start? Well just pull up this thread on your touchpad and lets get started! 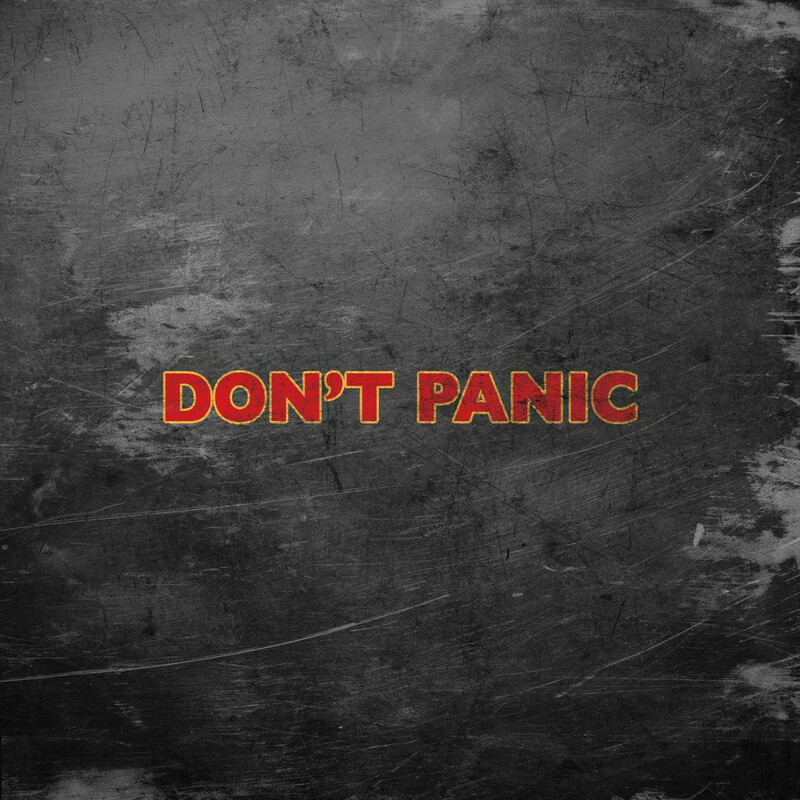 First off, you're going to want a nice calming wallpaper for the Touchpad to help you through this process. Press and hold your finger on the screen over the image below. A small box of options will pop up, select "Set Wallpaper". Ahh, don't you feel more relaxed already? Ok, now for a bit of housekeeping. The touchpad uses wifi to connect to the internet. It will do so on a wide range of routers, both G and N. That said, the touchpad will work remarkably faster if you utilize wpa2. If you are using any other security scheme you are likely severely limiting the top speed of your web browsing. Take a moment to go to your wifi router settings page - most routers allow you to do this by typing in either 192.168.1.1 or 192.168.0.1 into a web browser. Check your security/encryption and ensure you have WPA2 selected. Now you know your touchpad is going to operate at peak performance. Still with me? Good. Lets get down to business! Next up, your brand new Touchpad is rocking out of date software. You need to update it! There are two ways to do it. Option one is to tap the arrow at the bottom right of your screen, swipe to the right until you get to the settings page, and select the little icon named "System Updates" (it looks like a present). Allow the system to update, reboot, and attempt to update again. Ultimately (as of 2/6/2012) you want it to show your device is up to date with version 3.0.5. If this works, you can skip the next section of this post. I will say it here and multiple times below, do NOT run a webOS doctor unless you have a good reason to (like, you can't get your touchpad updated to 3.0.5, or you manage to break something). Your second option, is to run webOS doctor to update to 3.0.5. IF YOU HAVE ALREADY MANAGED TO UPGRADE TO 3.0.4 WITH THE NORMAL OVER-THE-AIR SYSTEM UPDATE DO NOT PERFORM THIS STEP. Once again, DO NOT DO THIS UNLESS YOU CANNOT UPGRADE IN THE "NORMAL" WAY! Did you hear me? Don't run webOS doctor unless you have a good reason to (your touchpad is broken or your touchpad won't update with the update program). Ok, I tried to warn you. Ready to do a webOS doctor? Lets go! In Windows XP, click on Start > Control Panel (or Start > Settings > Control Panel). Double-click on System, then open the Hardware tab. In Windows 7, click on start and type "device manager" into the search box, then select it when it pops up. Click the + at Universal Serial Bus Controllers. Right-click any of the USB Root Hub's and select Properties. Open the Power Management tab. Clear the checkmark from Allow the computer to turn off this device to save power. Repeat this procedure for every single USB Root Hub. If you'd like, when you finish running webOS doctor, you can go ahead and change these settings back (if it's a desktop I'd say don't bother, it's a -tiny- amount of power use to keep them powered and can save you the occasional USB related issue). Step 1: FULLY charge your touchpad. NOTE: Since you need a charged touchpad to perform this step, ensure your charger is working. If your touchpad isn't charging when plugged into the wall, this could be because of an odd quirk of the charger itself. It can be split into two pieces by twisting it and pulling it apart. Try twisting the charger back into "locked" position and you should be back in business. From there, go to device options, and select webOS doctor to download it. At this point, while it's downloading, grab your touchpad and open the launcher. Swipe over to settings and "device info". Perform a FULL ERASE. Finally, turn your touchpad completely OFF. The touchpad is now ready for the doctor. Once webOS doctor is downloaded on your home PC, run the program. 1: You are going to be connecting your device to your computer using the USB cable. You must connect your device directly to your computer, not through a USB hub or other intermediate device. Prepare for this step but do NOT plug the touchpad into the computer just yet. 3: Windows will find your device and may offer to install two different drivers. 4: When asked to install drivers of OMAP, select No, not at this time. 5: When asked to install drivers for Palm Novacom (bootie), select Yes and let the drivers install. This may take a while. Once the drivers have been installed, the Next button will become available in webOS Doctor. 7: Do not disconnect your device from the computer during the update process. 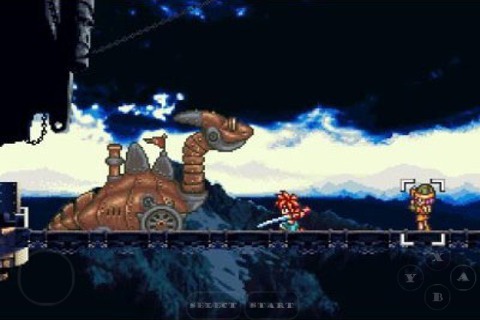 8: When the Reset Complete screen appears, click Done. 9: Wait a few minutes for your device to reset. If the Next button remains unavailable, it may be because your device was disconnected from your computer during the driver installation process. In this circumstance, Windows cannot communicate with your device to install the drivers until you clear the driver installation state. On your computer, right-click My Computer and click Properties. Click the Hardware tab, and click Device Manager. On the Device Manager list, locate the item displaying a yellow question mark and/or exclamation point. Right-click that item, and click Uninstall. Click OK to uninstall the device from the system. The driver state is now cleared, and your device no longer appears in the list. Run webOS Doctor again, connecting your device to your computer only when prompted. webOS Doctor stalled while checking my system. What do I do? Delete any instances of “Palm webOS(R) Doctor(tm)..." JNLP or JAR files that may be on your desktop. Download and run webOS Doctor again. The screen seems frozen during the recovery process. What do I do? If the screen displays a red battery icon, your device battery is being charged. This can take as long as an hour. Return to palm.com/ROM and run webOS Doctor again (see Resetting your device with webOS Doctor. Anyway, that's the long and the short of it. Again, you do this at your own risk, but it -should- be perfectly safe. You can make the judgement call. If you -do- manage to break your touchpad performing these steps please let me know and I will pull this whole section until there is a proper resolution of the problem. Now that the touchpad is up to date (3.0.5 at the time of this writing), it's time to get down to business. First - a couple onscreen-keyboard related housekeeping issues. 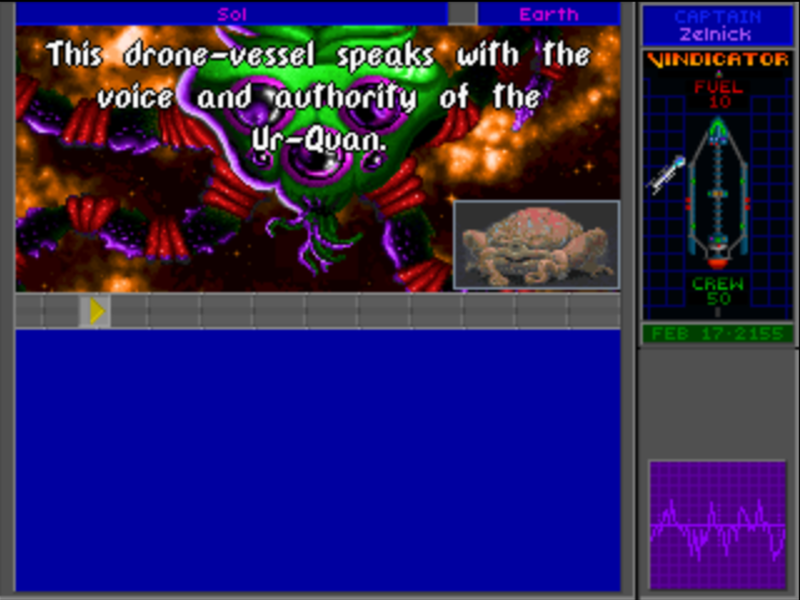 1: The onscreen keyboard can be size-adjusted by taping and holding on the keyboard icon at the bottom right of the onscreen board. (I prefer "large"). 2: The onscreen keyboard has a generally annoying "key click" noise as you use it. This can easily be turned off by going into your launcher, selecting the settings tab, and getting into the "sounds and ringtones" app. There are some really nice ones, including a thumbs-keyboard option and support for all sorts of languages. Fiddle around if it suits you . Peace and quiet, arrow keys, and a keyboard better matched for your own fingers, now -that's- more like it . With housekeeping out of the way, it's time to install some patches and tweaks that are going to make the touchpad run MUCH faster, smoother, and remarkably more responsive. This next section will also set you up to start checking out the wonderful world of webOS homebrew in all it's glory. The best thing about it? All of this is simple and safe to do thanks to webOS's approach to an easily usable open system. No jail-breaking required and there is virtually nothing you can do that would hurt your hardware. Worst case scenerio, you can run the webOS doctor listed above and fix your Touchpad. That'll bring up a little icon for developer mode. Tap on it and turn it ON. It will ask you to input a password, DO NOT INPUT A PASSWORD, LEAVE THIS BLANK, FAILURE TO HEED THIS ADVICE WILL REQUIRE A FULL WEBOS DOCTOR RESET. So once again, don't put anything in there, just keep clicking through with the password blank and move on. Now, plug your touchpad into your computer with the usb cable, and open up webos quick install. DO NOT PUT THE TOUCHPAD INTO MASS STORAGE USB MODE, just leave it on normally. The touchpad will ask if you want to go into mass storage mode, tell it no and leave it alone. Webos quick install will likely need to install a novacom driver to be able to talk to your touchpad, let it do so. If at this point webOS quick install is STILL not recognizing your touchpad, try rebooting the computer/touchpad, double checking to ensure developer mode is on, and try a different USB port for plugging the touchpad to the computer. Now your touchpad is ready for homebrew. First things first, you want to install the preware application. On your -COMPUTER- in the webos quick install window, click on the little globe icon on the right. That will bring up a list of applications you can install. Select PREWARE from that list and install it. Now you can close webos quick install, pick up your touchpad. Go to your downloads folder on the touchpad (click the arrow, swipe over to downloads). Finally, open preware on the touchpad. You're ready to patch and modify in earnest. Preware lets you do all the downloading, installing, and handling of your various homebrew right on the Touchpad. Yay! In Preware, you should start by installing Uberkernel and Govna. So, install Uberkernel and Govna, reboot the touchpad, load up Govna, and pick a profile that supports 1.5ghz or 1.8ghz. Easy as that, enjoy your new faster touchpad! If you don't understand how to do everything explained in that post, I highly recommend you do further reading on the subject before going further. The powers-that-be deliberately added a bit of a skill test here in order to prevent random users from experimenting with dangerous alpha-status touchpad tweaks. Bear in mind once again that while 1.5ghz-1.8ghz is considered -completely- stable at this time, going to test kernels at dual 1.8ghz or beyond is pressing your processor above it's stock specs and -may- be dangerous (cats and dogs, living together, mass hysteria). Again, what I'm trying to say here is if you don't know EXACTLY what you are doing and the potential repercussions, you should -not- pursue this avenue. You could end up with a broken touchpad and a frowny face. preader - It's a free and reasonably feature filled e-reader. Remove Dropped Packet Loging = it cleans things up internally but won't represent any kind of major performance boost - I prefer to eliminate all logging possible on my device as there is really no benefit to allowing it to continue. Unset CFQ IO Scheduler = not terribly important unless your using an advanced overclock kernel (like warthog or one of the F variants). This is unnecessary for uberkernel or stock palm kernal usage. Faster Card Animations = this simply speeds up the animation as cards open - it is a placebo effect that makes the touchpad FEEL faster even though it doesn't actually give you a stopwatch-based speed boost. YMMV, I prefer the feel of the touchpad with this installed. Buttah = I honestly don't see any issues with touchscreen sensitivity in 3.0.4. If you feel like you could use a slightly more responsive touchscreen however, here's your patch. YMMV. Muffle System Logging = Do it. This is an honest-to-goodness improvement. On one hand it gets rid of the unnecessarily high logging levels on the touchpad, on the other, it represents a small performance boost. Disable Search Engine Browser Notifications = This disables those annoying notifications that a new search engine has been found - the search engines still appear in your just type history so you can still add them, this just prevents the silly little notification from popping up and requiring you to constantly swipe it away (no, for the last time, I -DON'T- want to add carrottop.com to my just type search engine list, jeez). Disable lock screen = Disables the swipe-up lockscreen when you turn the screen on, allowing you to get straight to what you are doing. It's nice, especially since a basic swipe-to-unlock screen isn't really necessary on a tablet PC. Just Charge By Default = No more having to select USB or charging every time you plug the touchpad into a computer. Nice. Reduce Minimum Brightness = I find this necessary for quality e-book reading. There's a sweet spot just below the standard brightness that makes reading completely comfortable for me. YMMV! Feel free to try whatever you like. The patches are easily to remove right inside preware. Have no fear, you won't break anything. Even if you somehow managed to be the rare exception, salvation is one run of webOS doctor away. That's just a small sample, browse and check out what's available. New patches are constantly coming online and there may be one custom tailored to a quirk you noticed and want fixed. The next performance improvement you need to do is KILL LOGGING! HP decided to have your touchpad log and report a -lot- of unnecessary things, so many that it actually has a physical effect on your touchpad's speed and functionality. Since you probably don't want HP listening in to everything your doing even if it wasn't a performance boost, lets go ahead and turn this logging off. Now you'll be able to properly turn logging off (turn it to minimal). It will warn you that this is irreversible and say something about not wanting to open the pod bay doors, just tell it to do what you say or you'll rip it's battery out and lets move on! Thanks to Bevcraw for cluing me into this easy method. Now that some basic patching is out of the way, it's time for a LITTLE security-based housekeeping. If you've been watching the news, there was a pretty major security breach involving a company called DigiNotar and a WHOLE BUNCH of untrusted SSL certs. Most companies have already taken care of patching this vulnerability, but HP hasn't been quick to release a patch to remove trust of these certificates, so your touchpad still believes they are genuine. That may sound greek to you and you may say "why do I care?" In plain english, this is REALLY BAD NEWS. Bad people can utilize these certificates to play "man in the middle", for example pretending to be Google and stealing any information you put through the system. These bad certificates have already been used to steal passwords to hundreds of thousands of email accounts among other really bad things. It's worth taking the time to protect yourself. Thankfully, codecrumb has come out with an app to fix it. Search preware for "remove untrusted" and go ahead and install the application. Problem solved! Tap on local storage. From there, you can manage your flash player privacy settings. At the -very- least you should use the "only from the sites I visit" setting to help prevent your flash player from assisting websites in tracking your surfing habits. Personally, I just turn the local data storage off. Yeah, it means I might need to adjust my volume next time I'm using youtube but I feel better without flash cookies watching me surf the web. Last but certainly not least, lets get a proper SSL secure and -encrypted- google search added to keep our queries nice and private. Pick the touchpad google SSL, wait about 5 seconds, and a little popup will appear at the top of your screen saying "new search engine found". Add the search engine, and then set it as the default search engine for your "just type". You can change this while adding the engine, or if you've went past that just go into your launcher, tap settings, select "just type" and there is a spot there to change your default search engine. All of those patches are nice, but there is still at least one application on your touchpad that is in SERIOUS need of assistance - the PDF reader! Thankfully, a group of hard working touchpad devs have done all the work making it functional. One small disclaimer though: This patch is NOT the most intuitive to remove. It shouldn't be a big deal - at worst, if future webos updates break your pdf viewer you -should- be able to simply delete the app and reinstall from the app catalog. That said, the PDF viewer is basically UNUSABLE without these patches. All of the instructions are there including how to install the patch. JUST DO IT. This patch will enable proper zooming on documents, add a goto button to move about the document, and more. An uber patch for the PDF reader is also being discussed, so stay tuned on that one! For our next trick, we can go to HP's official apps catalog. Hit that arrow, swipe to the downloads tab, and hit the HP App Catalog icon. LCARS clock - A star-trek themed clock that is actually pretty neat even for a non-trekkie like myself - complete with the option of using your own music or MP3 as an alarm sound. Can't knock it, especially considering the nonexistent price. Created by danPLC, a community member who happens to be an INCREDIBLY talented developer. Take my advice on this - if you intend to use the touchpad as a music player there is absolutely no better program available to best facilitate this. In fact, this is one of the best and most accessible music player apps available on -any- platform. You owe it to yourself to buy this app. These words are in no way solicited - as a fellow user I'm telling you that if I could only purchase ONE application on the touchpad, this would be it. Rather than bore you with a giant list of features, let me just tell you this app has everything you ever wanted in a music app, and tons of features you didn't know you needed . Kalemsoft Media Player (it's 6.99$, but it'll allow your touchpad to play almost any video you throw at it at full-speed including many of those nutty 1080p's you might have laying around). Unlike the free "touchplayer" app or the built-in video player that requires you to encode in a very specific mp4 format for stutter-free playback, this program provides nice clean video from basically everything in your media folder. Also very frequently updated and has the option of streaming media from a home PC at a quality that easily rivals options like ORB. NomNomNom - A great google reader/RSS reader. Works great and has a great dev behind it pushing more features etc. ComicShelf HD - An amazing comic reader, full of nice features and works beautifully. Well worth the tiny price if you want a .cbr reader. Advanced Browser - Tabbed browsing, thumb-controls for back/forward, bookmark homescreen, and it runs roughly just as fast as the stock browser. 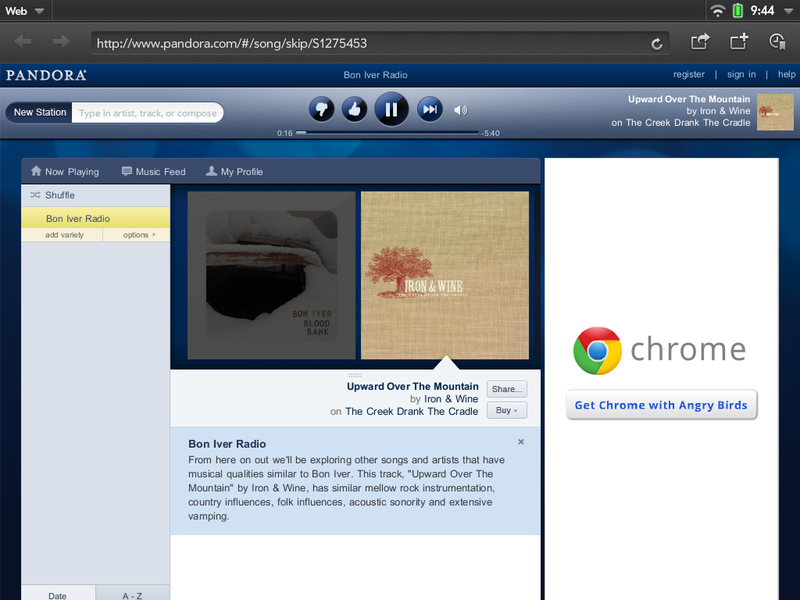 This browser wont fix some of the annoying traits of the webOS stock browser but if you're looking for tabs etc it is really slick. Definitely nicer than stock. Asphalt 6 - Feels like the best racing game currently on the touchpad, and it's half the price of need for speed hot pursuit. Fun for burning some casual time and supports nice customization in terms of control schemes etc. AudiophileHD Pro - An interesting set of features for a music app. Lets you play various formats including flac and gives you a chance to "mess" with the audio a bit including speeding up and slowing down the track, and allows for some interesting tweaking of tracks. That said, it's not terribly feature-rich in the general usage/organization/playing of your tracks. YMMV. SimpleClock - It's a simple clock with weather display. It's cheap and it has a giant snooze button, it also looks great on the nightstand in exhibition mode. Not a bad app - I recommend it even though free options exist. Big Boss - Great for a two and a half year old, fun for them to go around swatting the little enemies. Honestly more of a kids game. Sparkle HD - A zuma clone that does the job nicey, fun for some quick tap-tap action. Feel free to browse for anything else you might enjoy. Hulu -can- be fixed to work on the touchpad. Ok, after much annoyance and a couple webOS doctors, I think I FINALLY have an all-in-one fairly idiotproof patch... This patch is for webOS 3.0.4 -only- (I was doing some investigations into supporting 3.0.2 as well, but it is currently broken in this patch, do NOT use this patch on 3.0.2). WARNING!!!!!! If you have already done this patching process manually, this patch MAY NOT WORK! You may break your flash player if you run this patch after having performed the manual work and require a visit to the webOS doctor! DO NOT RUN THIS PATCH UNLESS YOUR TOUCHPAD IS COMPLETELY BACK TO STOCK ON IT'S USER AGENT AND FLASH IDENTIFIER STRING. Warning #2: This patch is designed for 3.0.4. Once again, DO NOT USE THIS PATCH WITH 3.0.2. This patch is designed for 3.0.4. This is an ALPHA patch. It will likely throw an error or two but it should work. You should be able to run this patch and it will install the hulu user agent fix AND the flash fix without requiring a reboot. Again, this is an ALPHA patch and I am not responsible if you install it and it magically borks your touchpad. This will do nothing a webOS doctor won't fix, so gauge your willingness to test this patch on whether or not you'd be ok running a doctor if things go wrong. Now EXTRACT (unzip) it to an easy to find spot (like your desktop). OR: open a terminal window on the touchpad itself in xterm (you will need to install xecutah, xserver, and xterm from preware to do this). The device will very likely pop an error or two (again this is an ALPHA patch), but it should finish up without any real trouble in under 30 seconds. There is NO reboot required. TADA, HULU works once more! Your app catalog is now broken. If it's still not working (black screen on videos) you need to remove any adblocking patches you have (adblock or max blocker), delete cache/history/cookies in the browser, and reboot the touchpad. Now Hulu will work. This will break hulu and fix your app catalog. It'll take 30 seconds or less to complete and you're back in business. The patch will stay on the device, so you can easily flip back and forth from hulu installed and uninstalled. Would you like to have Google handle your music collection? 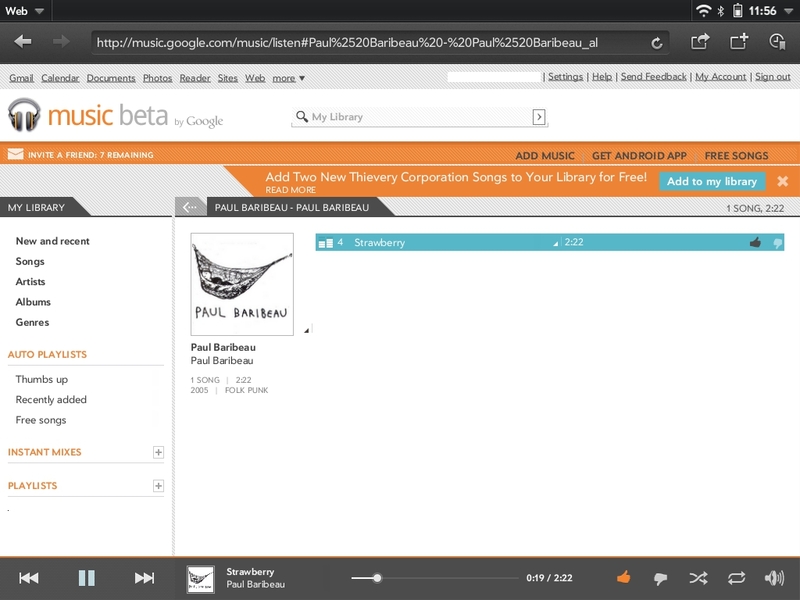 No problem, google music works brilliantly on the touchpad! With a little luck google should send you a beta invite in a few days or weeks and you can join in the fun. Dump your collection into google's servers overnight and enjoy free streaming and management of thousands of songs without having to use up any of your touchpad's onboard space. Brilliant! Next up, lets talk a bit about the touchpad's video player application. Basically, it lacks support for almost every known codec and you'll have a bear of a time getting videos to watch as a result. KalemSoft makes a -wonderful- paid application for playing virtually any video file you care to throw at it (even 1080p .mkv's) beautifully. If you want to go that route it'll make things VERY easy. I repeat, buying KalemSoft is a drag and drop solution, no re-encoding of videos required. Touchplayer is another option - it's a free application you can download as well that'll play most formats and recent updates have made it nearly comparable to kalemsoft's offering. Now run handbrake and pop in the DVD you want to rip. A dialog box will pop up asking you if you want to rip the DVD. Now click on the various tabs under OUTPUT SETTINGS (PRESET: IPAD), you want to adjust several settings for a perfect touchpad rip. Now set a destination file for your ripped file and start ripping. Tada, a perfect rip specifically ripped for your touchpad that will take advantage of it's native resolution etc. 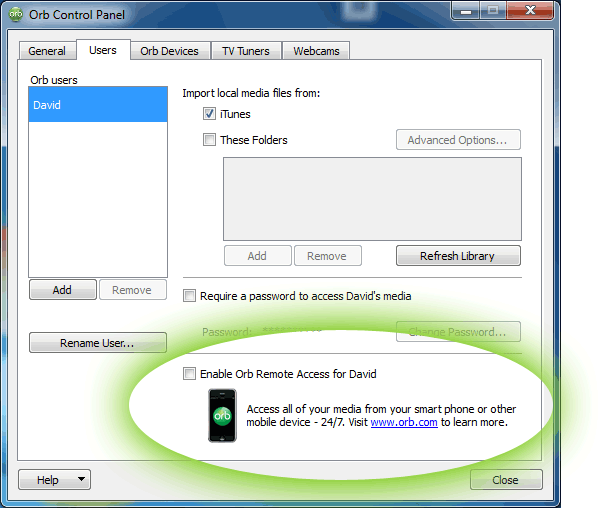 If you want to stream some video from your PC to your touchpad it's time to set up ORB! Orb is a free media streaming software that makes your home collection of videos available on the touchpad (and can even stream your webcam). You can also do this with paid apps like KalemSoft Media Player. Once installed, it will ask you where your various media is located (videos, music, pictures, etc). Set it up properly. Log in with your username/password you've already created. Log in, and you'll immediately have your whole computer at your disposal. There's only ONE more thing you need to do. Tap on SETTINGS at the top right of your screen. It'll bring up a popup control panel. Click on the drop-down menu and go to GENERAL. In the STREAMING FORMATS tab, click on ORB FLASH PLAYER. You can also change your user interface if you'd like - in the SKIN tab there is a selection called "Home Theatre" that looks and works particularly well on a tablet . The standard PC skin works nicely as well though. TADA! 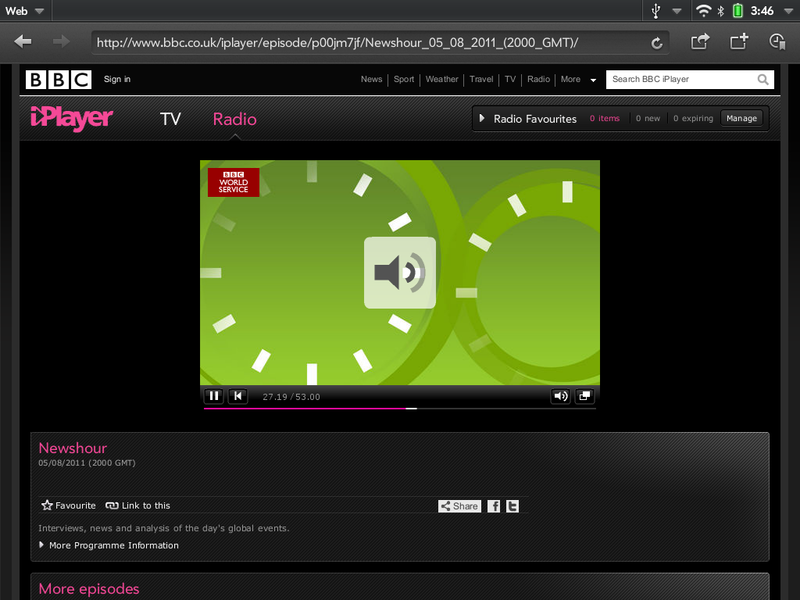 Instant -free- streaming of everything on your home PC to your touchpad. Also support for TV capture cards, the webcam on your desk (you can remotely look at what's going on in your house - remote security, haha), and all sorts of fun stuff. Bookmark this website and you have all of your media ready to go anywhere you are. So, now that everything is done, what -else- can you do with this thing? 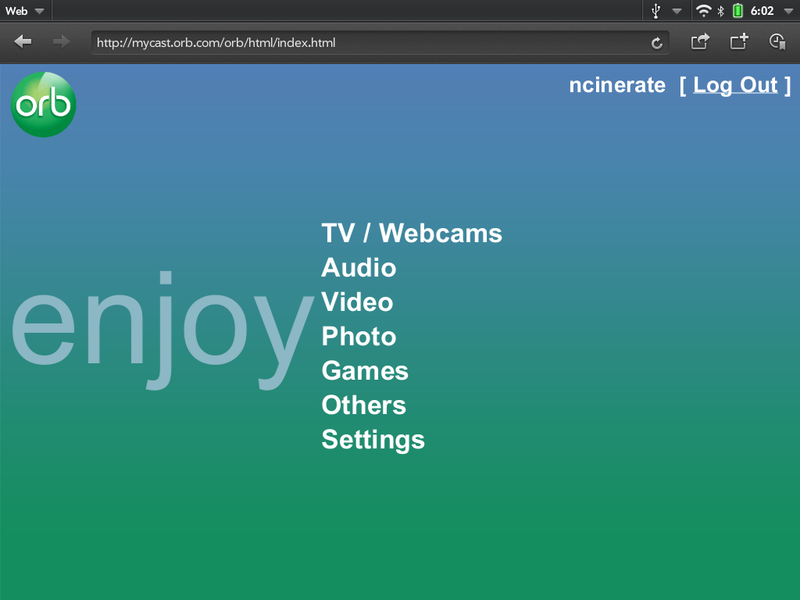 Well for one, you gotta love having flash - almost every website I've visited works beautifully, especially when you double tap or fullscreen the flash element (always fullscreen video, it will play perfectly smooth if you do). Hulu works brilliantly provided you performed the step in this instructions that involves fixing it . Many other websites are particularly well suited to the Touchpad. The sky's the limit here. Other fun stuff includes pairing a webOS phone to the tablet so you can make phone calls etc right off the touchpad (hopefully we'll get a patch that'll allow pairing of any bluetooth phone eventually). Skype video calling is easy and fun from the phone app. The Kindle app gives you access to the kindle library. The facebook app is great. And of course, exhibition mode really shines if you have your touchpad sitting around charging. 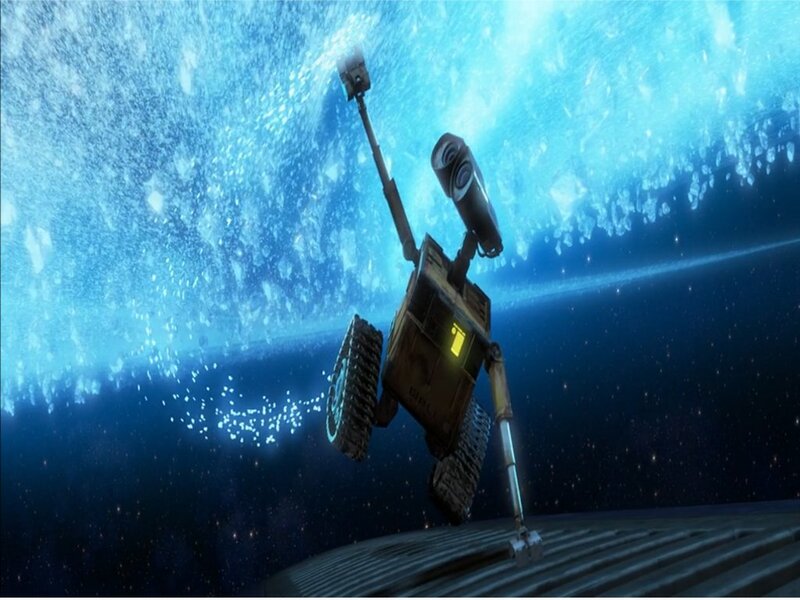 You won't stop finding neat new things to do. You can run ubuntu in a card (advanced at the moment, but undoubtedly will come down in complexity as time goes on). You can minimize a card either by using the home button, or by swiping up from the bottom edge of the touchpad (from the bezel). To delete an installed app, tap and hold on an icon, then hit the X when it appears. You can move an app in much the same way, tap hold, then drag when the gray boxes appear. You can take a screenshot by holding the home button, then pressing the power button. You can easily add new search engines by browsing the web to a new search engine, then adding it when the prompt pops up that allows you to do so. 2 finger pinch movements can zoom in and out in the browser. Your charger can split into two pieces (for some unknown reason). Some came from the factory SLIGHTLY twisted inside, which appears normal but will not allow you to charge. Try twisting the charger piece slightly to lock it back into place if this happens to you. Double tapping on flash objects brings them into full focus and allows you to properly fiddle with them. With the home button on the LEFT hand side of the touchpad, you can do something fun with minimized app (center button or with the bezel-into-screen swipe mentioned above). Tap and hold on the app, pull it down toward the bottom of the screen, then let go. WHEEEE - slingshot. You can turn off the annoying keyboard key click "clicking" sound. Go into your settings and select sounds and ringtones. Turn keyboard clicks OFF. Text assist (in settings tab) can allow you to edit the user dictionary. Take a moment and add common but oddball things you might type (for example, your e-mail address or name). This will save you time in the future. If you notice other words giving you problems, fix them the same way. Want to try Ubuntu out on your touchpad but you're scared because of the need for crazy partitions and metadoctor usage? This isn't ideal (it's better to make a specific partition etc), but this will get ubuntu up and working in the EASIEST way in the next couple minutes without any meta-doctoring or linux-knowledge if you REALLY want to do it. Everything will run fast and you'll get a kick out of it. If you decide you want to REALLY utilize ubuntu to the -max- you can easily reverse this process and go through the -harder- steps to get things set up properly on a big partition (that goes beyond the scope of this guide though). Do this, of course, AT YOUR OWN RISK. This should be -completely safe- but don't get mad if you manage to botch my instructions and need to use webOS doctor to fix your touchpad. Also, take heed of the small warning at the bottom of this section regarding "missing gigabytes of space" on the touchpad. The way we're going to set this up is to run Ubuntu out of a -file-, rather than partitioning a drive etc. There are some downsides to this method (limited space being a big one), but for someone who wants to try out ubuntu on touchpad this is the easiest AND easiest-reversible way to do it. By the time you're done performing these steps you'll be running Ubuntu with a graphical environment, libreoffice, and of course chrome. You'll also have room to install some other stuff if you want to experiment, it's nice. Follow each step EXACTLY! So, first you need to download 3 programs from preware. Now, open up Xecutah on your touchpad. Xecutah will bring up a window that shows xterm. Tap on Xterm. Now you have a terminal window showing you root on your touchpad. (you can also perform these steps in webos quick install by going to tools/LinuxCommandline, but in this case I want to get you familiar with xterm). Now that you're at a terminal command-line, type each of the following lines, followed by hitting the enter key. Bear in mind, some of these actions take a good long time, so don't panic if things don't seem to be moving along - it takes awhile to set up a nearly 2 gigabyte file. Just use the command and set the touchpad aside while it does it's work. What you've done here is create a file 1.9gigabytes in size (remember, touchpad cannot handle files over 2gb in size). This file has then been mounted and will be used as a virtual "harddrive" for ubuntu. I'm not including instructions here on how to auto-mount this drive at boot-up. If you reboot your touchpad you will need to mount the drive again before you can load ubuntu (by using that last command above, the "mount -o loop /media/cryptofs/ubuntu.img /media/ext3fs" command, in a linux command line). For a casual user, the system I've just lined out will work just fine, just remember to mount the drive before using ubuntu if you have rebooted. I leave it this way to make testing and eventual removal of ubuntu trivial . So, if you've followed this guide EXACTLY, you now have a file created and mounted ready for ubuntu. Close your xterm cards. Now go into preware and install ubuntu chroot. As it installs, it will automatically populate the file you created for it. Finally, open back up xecutah and go back to xterm. Minimize xterm and go back to xecutah, select UBUNTU. Hit enter and watch as your computer updates apt-get. The only difficulty with this script is it puts you into linux as a user rather than root. This isn't a problem for casual users, but is immensely annoying to me. Tada, you'll be inside lxde ready to go as a root user. If you followed this guide then you'll need to type lxsession every time you wish to return to the graphical environment. For example, if you reboot your touchpad you will have to open up executah, open xserver, xterm. Mount the ubuntu.img file as described above, then open ubuntu from executah, and finally type lxsession. That sounds like a mouthful of steps, but it's actually quite simple and only takes a few seconds. That should finish up all of your optimizing and you should have an awesome ubuntu box ready to go! Also, at this point you can download tweaks from preware and adjust or turn off the virtual keyboard. If you ran the script above or if you have a bluetooth keyboard you don't need the virtual keyboard as lxde will have an onboard one built in. Now that you're in LXDE you can tap the little globe on the bottom-left and it'll pull up a full blown chrome window, ready for use. Do that now. Scroll down and install the -newest- version of chrometouch (it'll be right near the bottom). 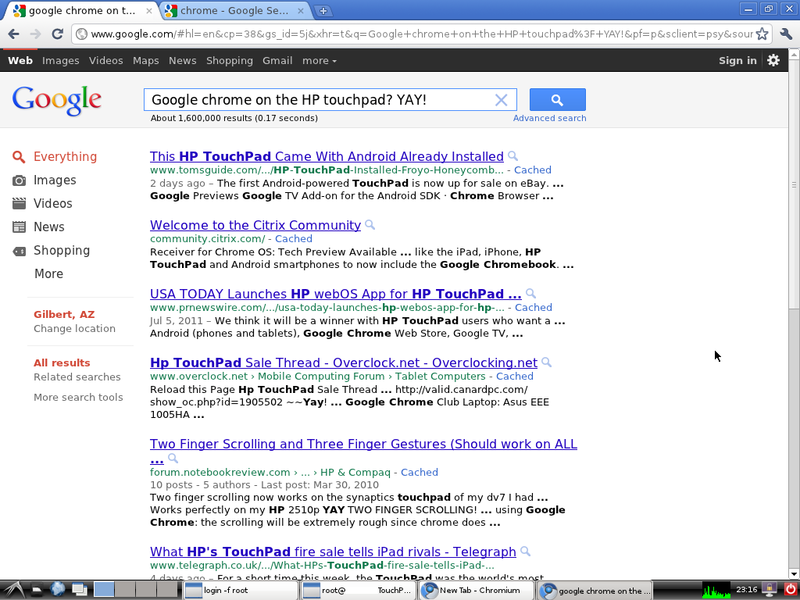 Once you've done that, you can easily scroll and utilize your touchscreen to navigate chrome. YAY! Now that you're finished setting up chrome, you can set up anything else you'd like. Tap on the little arrow at the bottom left and it'll pull up a menu with various applications, preferences, etc. If you tap on preferences, you'll find the synaptic package manager. Load this up! Now you can search for packages. This makes it easy to find and install things like libreoffice, gimp, etc. You're done! Enjoy Ubuntu . If you want to have this drive mounted automatically every time you reboot your touchpad, I'd highly recommend getting more involved instead and doing a proper partition/mount. This install process will easily let you get things rolling, and you can always go further if you'd like. That'll delete the file you created to house ubuntu, along with everything inside it that you've installed/downloaded/etc. Finally, follow the instructions at the very bottom of this section (in the WARNING area) to finish deleting the last 1.9gigabytes of remaining ubuntu stuff. One quick sidenote that I'll repeat here - if you are using a bluetooth keyboard and want a FULLSCREEN option for ubuntu, go into preware and download tweaks. It'll allow you to tweak things for fullscreen mode with no virtual keyboard in xserver. Thanks to rennat, DTZ, and the whole webos internalz crew for making a guide like this possible . I've cribbed info from all of you and I've hopefully put it in a simple format for someone coming into this blind. ONE SMALL WARNING HERE!!! If you perform this action more than once, you will wind up adding 1.9gigabyte files to your touchpad that will stack up and eat the space on the device EVEN IF YOU DELETED THE UBUNTU.IMG FILE! You can delete these manually by plugging your touchpad into the computer and putting it into USB mode. Set windows to view hidden/system files, then open the touchpad up in your file explorer and go into the .palm folder (it was previously hidden). There you will find the 1.9gigabyte files I'm talking about. Delete them and you're good to go. I mention this because in the course of testing things I managed to eat up 12 gigabytes of space this way and had to figure out *** to do to get it back. Enjoy your new tablet and settle in - now that there's a large user base for the touchpad I get the feeling great things are going to happen here soon! Feel free to add if you think there's anything else the newbies need to succeed. A special thanks to everyone who's made this guide possible as well. The webOS family here is a big reasons I've stuck with palm through all the little ups and downs. Thanks to the webOS internals dev team, to unixpsycho, codecrumb, and to the many other users I've relied on for assistance over the years. I hope this guide gives a little back to the next generation of users . I will continue adding to this guide as time goes on to maintain it as a correct and up-to-date resource! This community's outpouring of thanks and support have made me excited to do my part here! Thanks again to everyone who took time to !!! Last edited by ncinerate; 08/15/2012 at 11:44 PM. konsole, IGNTNUNLMTD, jennkaotic and 233 others like this. brilliant post. This should be made a sticky. _Stephen and Josh S2 like this. This is the most informative post I have seen for beginners. I am a day or two away from getting my touchpad. Thanks for the help! what version of java do we install? The newest version of java is fine. Whatever works on your main computer operating system (you install java on your home PC or mac, not your touchpad). brum and richard marron jr like this. Is there any way to take screenshots on the Touchpad? Absolutely. Hold the center home button down, then press the power button. But what is the question? WHAT IS THE QUESTION!?! sledge007, kangur, fredewins and 1 others like this. Thank you very much for the guide. Was planning on sifting through the patches and kernel work so you saved me a nice amount of time. =) Here's to hoping my order really does show up on the 24th. No sweat - I figured since I'd spent a few days getting things "just-so" I'd throw together a quick writeup for anyone else getting onboard. It's all fairly simple for anyone who's already used a palm webOS phone, so this is more of a guide for people coming in blind . Glad it helped. I'm getting my touchpad tomorrow. Thanks for this post! Awesome. Thanks for all your information. Great info and thanks for sharing! I do agree here. My wife is taking a shine to the touchpad and it'd be nice if we could pair her phone up too. Not totally necessary, but cool if it was possible. Same goes for the various brands of printers. Annoying that it's locked out to HP or nothing but not totally critical as I don't intend to do a lot of printing off this thing anyway. I look forward to a multitude of patches, I imagine we'll see a nice upswing in patching with the suddenly large user-base. very cool post. Like many others, I have a confirmed order through HP and waiting on my TouchPad. Can't wait to get up and running!